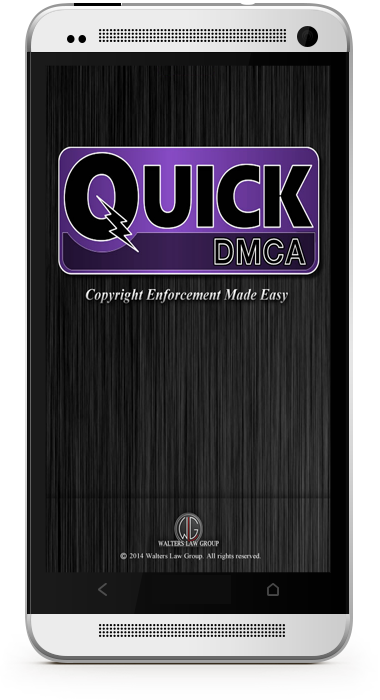 The app for creating a quick and easy Legal Notification of Infringement. This productivity app is designed to allow copyright owners the ability to enforce their rights. 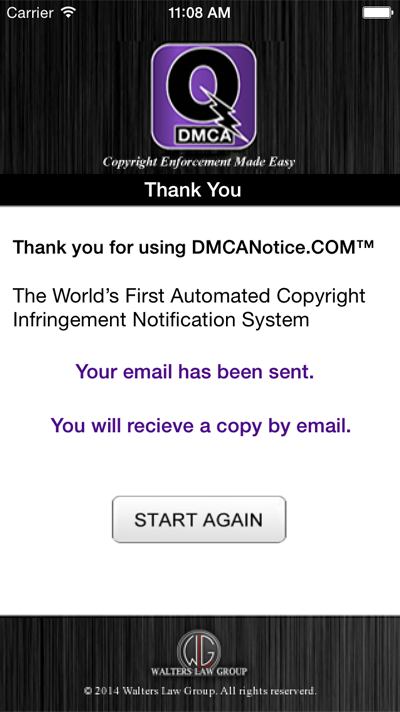 Send the DMCA Notice directly from your mobile device. 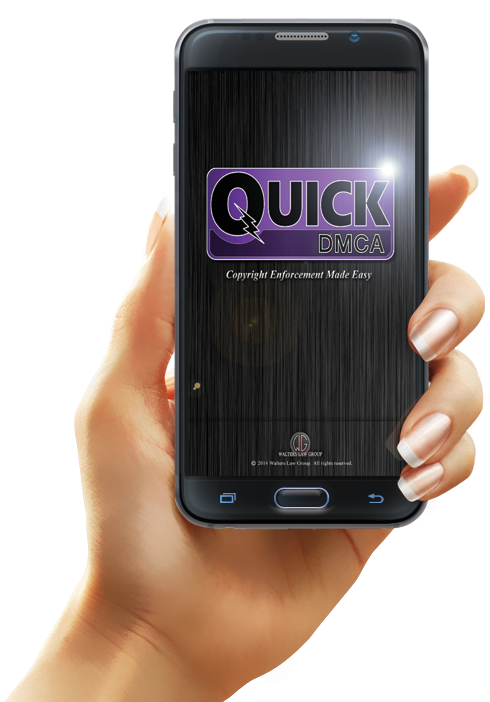 QuickDMCA™ allows users to protect their valuable content from online piracy, at the touch of a button. Under federal law, after receiving a DMCA Notice, the service provider is obligated to disable access to the content or cease providing services to the infringing material. Repeat infringers must have their accounts permanently terminated. 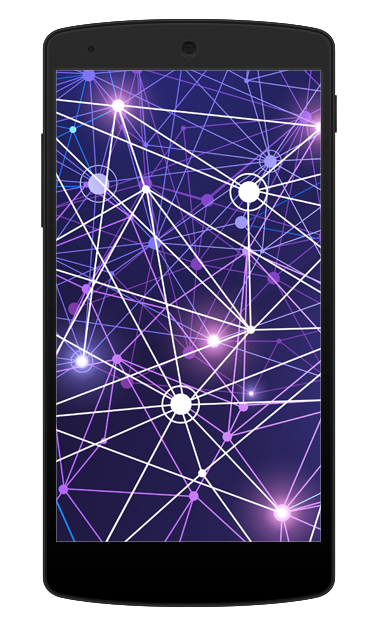 Online service providers like hosts, third party billing processors, name servers, and payment gateways, must respond to DMCA Notices promptly, or risk becoming vicariously liable for infringement caused by their customers or subscribers. The application will allow the user to generate a DMCA Notice that contains all the necessary legal statements and information required by federal law, in minutes. 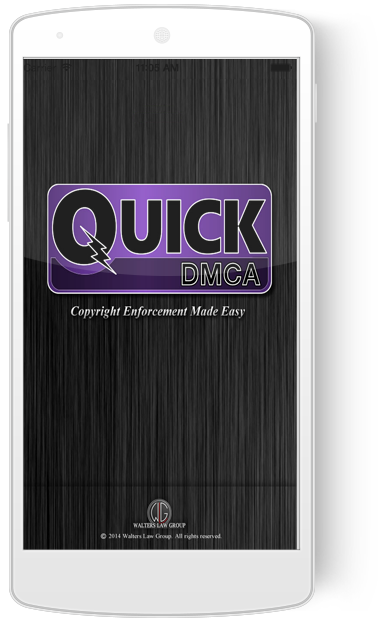 DMCA Notices can cause infringing content to be quickly removed from the Internet – often in a matter of days…or even hours! 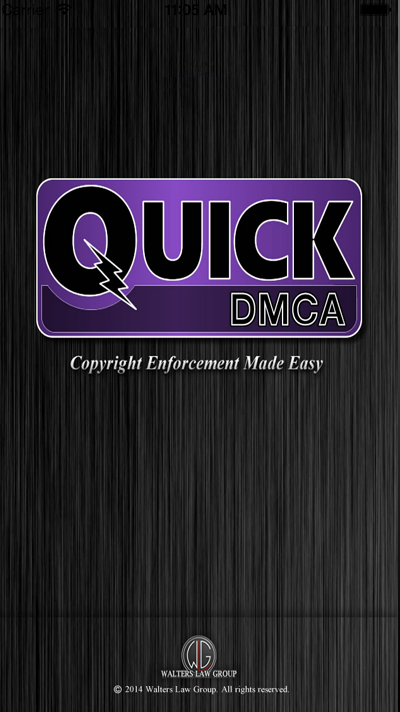 QuickDMCA™ solves a common cyber-theft problem encountered by publishers of creative content such as pictures, videos, music, software, or graphics. Policing the unauthorized reproduction of your expressive works has never been easier. Find the proper Designated Agent associated with specific online service providers. 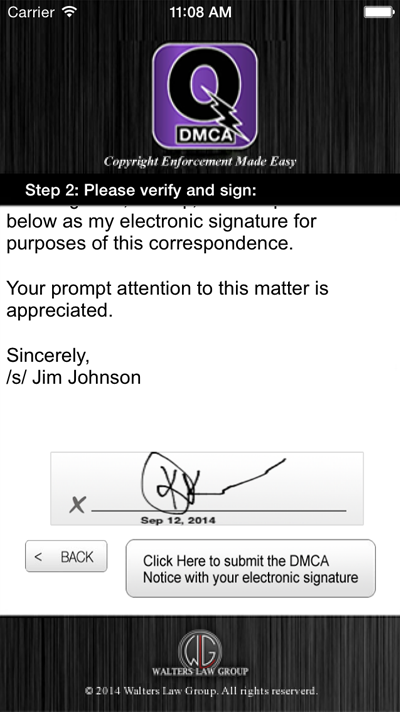 Execute the DMCA Notice on your touch screen, to capture your eSignature. 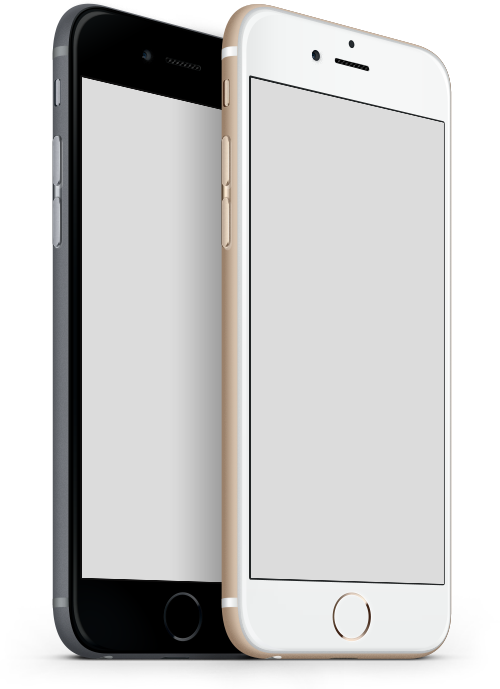 Send the DMCA Notice directly from phone in both plain text and .pdf formats. 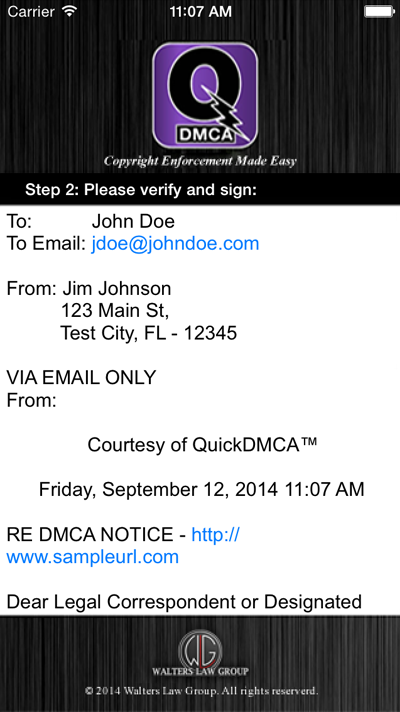 Instantly receive a copy of the transmitted DMCA Notice for your records. 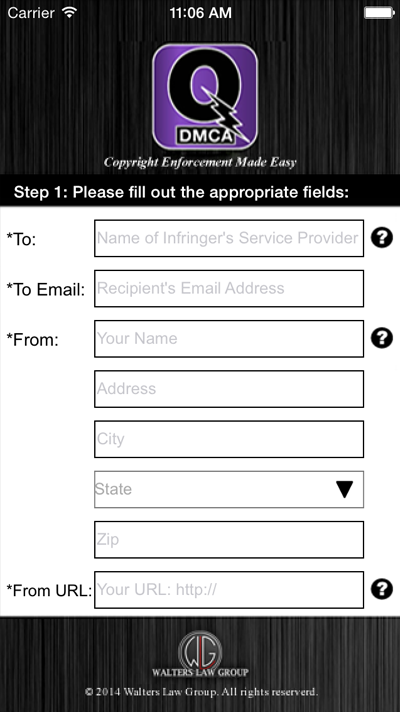 Inventor of the patented BirthDateVerifer™, the Quick2257® mobile app, and other technology designed for the online entertainment industry, this app streamlines the process of generating and transmitting DMCA Notices for the purpose of enforcing copyrights and taking down infringing material. Protect your company content and identity. 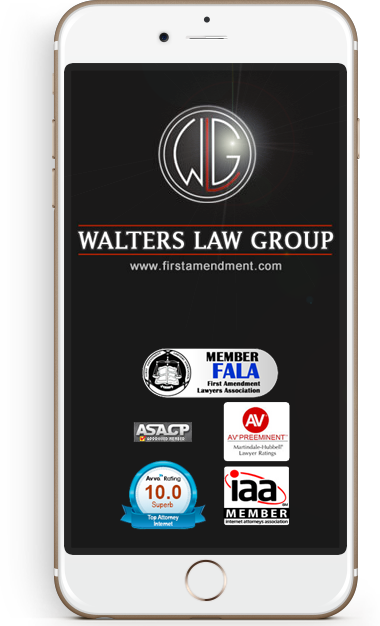 Anyone involved in the creation or publication of digital media can now quickly generate and send the necessary Notification of Infringement under federal law, using this simple mobile app. Download the App Now today!